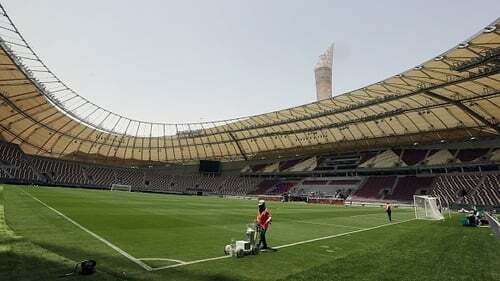 Officials from the Gulf Arab states boycotting Qatar did not turn up to the draw for a Middle East soccer tournament in Doha and want to postpone the competition that could be an early test for the 2022 World Cup hosts. Requests by the United Arab Emirates (UAE) and Bahrain to delay December's Gulf Nations Cup had been rejected, however, the Arab Gulf Cup Football Federation (AGCFF) said. "The tournament is going ahead on time," AGCFF General Secretary Jassim al-Rumaithi told reporters after the draw. Saudi, Emirati and Bahraini officials did not attend the draw. The other nations scheduled to play in the tournament are Iraq, Oman, Yemen and Qatar. Kuwait, who have featured in past competitions, can play only if a suspension by FIFA is lifted in time. In June, Saudi Arabia, the UAE, Bahrain and other Arab states cut political and economic ties with Qatar over accusations that Qatar supports terrorism - a charge Doha denies. Al-Rumaithi said Saudi Arabia, the UAE, and Bahraini had not confirmed their participation in the tournament, and that the competition needed at least five teams under the current format. Hamid al-Shaibani, chairman of the competitions committee, said teams that chose not to compete could face financial sanctions. The Gulf Nations Cup is being held in Qatar as the state spends billions of dollars on preparations to host the 2022 World Cup, and also as Saudi Arabia get ready to compete in the 2018 World Cup in Russia. Qatar, Bahrain, Iraq and Yemen have been drawn in Group A, with Saudi Arabia, Oman and the UAE in Group B. Kuwait will join Group B if their FIFA suspension is lifted. FIFA banned Kuwait's national soccer federation last year over alleged government interference in the running of the body. Oman Football Association general secretary Said Othman al-Bulushi said that delaying the Gulf Nations Cup would be damaging for regional football. "It will be a negative for the sport in the Gulf countries but we hope that the three countries, Saudi Arabia, UAE and Bahrain, will be participating, inshallah (God willing)," he said. In June, FIFA said a Qatari referee had been removed from officiating a 2018 World Cup qualifying match between the UAE and Thailand "for sporting reasons and in view of the current geopolitical situation.